part of national bike week, an annual opportunity to promote cycling and show how getting on your bike can easily be a part of everyday life. We were delighted that Joanne McCartney, London’s Deputy Mayor, Peray Ahmet, Haringey Council Cabinet Member for the Environment and Emine Ibrahim one of our local Harringay Councillors joined us to celebrate national bike week and came along to hear what a positive difference the bridge closure is making to cyclists from across Haringey. Well over 300 cyclists use Wightman between 7:30 am – 9:30 am each day to commute to work. This means 300+ less people driving to work or adding to crowds on public transport, benefiting everyone. 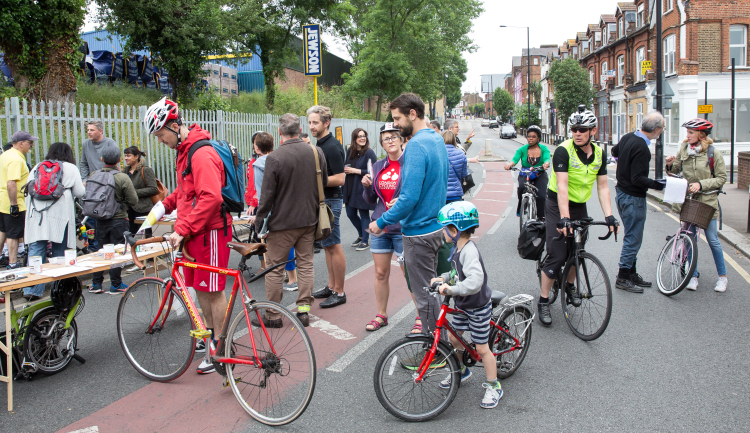 Cyclists told us about their journey through Harringay. Our survey found that 96% of cyclists would prefer Wightman Road to remain a very low traffic road, as it is now, with 4% as yet undecided what the best solution going forward is. It was inspirational to hear stories from cyclist of how removing through motor traffic from this road has transformed their lives for the better. 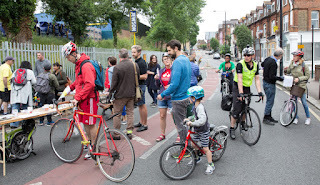 Before the bridge works cyclists said they found Wightman Road dangerous and 72% said that the main benefit of the current arrangement is increased safety. Cyclists also mentioned that their cycle was far more quiet and pleasant, quicker and less polluted. They had noticed more children playing and cycling and the local community enjoying their street. Even in the short time since the closure,16% of cyclists had shifted their journey from Green Lanes and 4% had shifted from public transport or driving to cycling their commute since the bridge works. One reason for retaining a low traffic route, perhaps similar to the current configuration is that Wightman could then be promoted as a safe cycling route. It would become part of a 4mile+ safe cycle route through Alexandra Park along Wightman and through Finsbury park, linking Muswell Hill and Alexandra Park to Central London. More people locally and further afield would be encouraged to give up their car commute. This is one example of how Living Wightman’s vision is about improving the people’s lives locally and in other areas of Haringey and in other London boroughs too. We’ve noticed dozens of children enjoying the chance to cycle safely along Wightman to school. Whilst this has immediate benefits, it also lays the foundation for cycling into adulthood, by increasing confidence on the roads. We appreciate that the traffic at peak times and during the weekends, especially on Green Lanes and Turnpike Lane is currently creating longer journey times for car and bus users. Living Wightman is also campaigning for solutions to reduce these. We believe it’s particularly important to get the buses moving. There has always been a problem with bus journey times in the area and the Harringay traffic review and our campaign presents us with an opportunity to improve these. We’re confident a lot can be done. Whilst traffic experts are the people who need to identify what will work best, the positive, wide ranging ideas generated by Justin Guest's post about possible solutions is also just what we need. Meanwhile let’s recognise that the bridge works have taken hundreds of cyclists out of danger and encouraged our children to cycle and celebrate that.